Charles L. Quarles is director of PhD studies and professor of New Testament and biblical theology at Southeastern Baptist Theological Seminary in Wake Forest, NC. 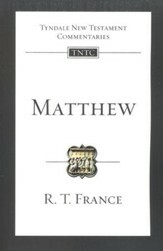 "This commentary on Matthew is a welcomed addition to the EGGNT series. Quarles has developed a well-deserved reputation for excellence in his scholarship. This work will only add to that reputation. It is a go-to-text for anyone who wishes to rightly interpret the first gospel." "At a time when more and more people are bemoaning the state of teaching and preaching in our churches, its refreshing to read one Greek teacher who is trying to make things right. Quarles will give you a thorough immersion into the Greek text of Matthew without being pedantic or overly technical. 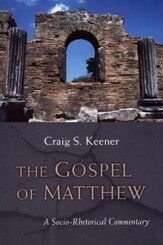 His superbly researched work is foundational for the study of the first Gospel. Heres a guide that shows you the right way to use your Greek in ministry. My favorite sections are the homiletical suggestions that are based on the text itself. Quarles is fast acquiring master status on the Gospel of Matthew." "Quarles continues to distinguish himself as one of todays leading Matthean scholars with this commentary. 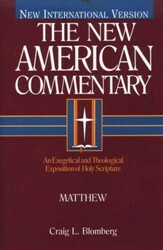 Unlike the other volumes in the EGGNT series thus far, this is not a survey of the best of previous commentators with assessment of interpretive debates, but a full-fledged grammatical and discourse analysis of Matthew itself. Quarles blends the best of the classic Mounce/Wallace approach with the best of the newer Levinson/Runge approach to create a work like the Baylor Handbook on the Greek New Testament on steroids. A wonderful gift to both the academy and the church." "Quarles has provided exegetes of the Greek New Testament a model guide for the study and interpretation of the Gospel of Matthew. Readers will be impressed by the way this scholar and master teacher weighs the lexical and grammatical options judiciously and clearly. Quarless commentary is learned yet very readable. All exegetes of the Greek text will benefit from this carefully written book. I highly recommend it." "These volumes aim to close the gap between the Greek text and the available tools: Greek language tools on the one side and commentaries and other studies on New Testament texts on the other. Quarles fills this gap admirably for Matthew. We get clear presentation, balanced judgments and a good sense of the value and limitations of language analysis for understanding this Gospel." "Of all the recently published New Testament and Greek resources, the EGGNT series is the one that excites me the most. You can think of this volume as a seminary-level Greek exegesis course in paperback. Also, each EGGNT volume provides sermon outlines based on the structure of the Greek textconnecting meticulous exegetical analysis to the faithful preaching and teaching of God's Word. 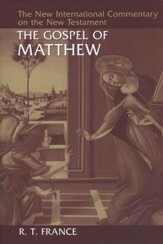 Quarless excellent new volume on Matthew will not disappoint. It is a faithful guide to the Greek text and will benefit students, pastors, and scholars for years to come." 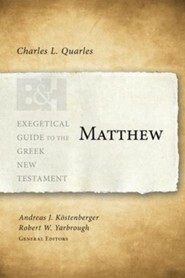 I'm the author/artist and I want to review Matthew: Exegetical Guide to the Greek New Testament.